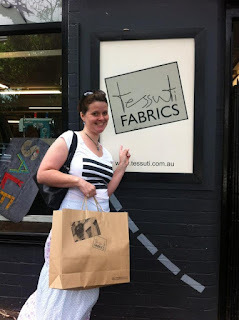 I had the immense pleasure to be spoiled with a trip to Tessuti on the first day of its sale. 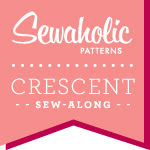 They have 10%-50% off most fabrics. I usually can't afford to shop at Tessuti but the fabrics are so worth the money, if you have it. I managed to pick up one metre of black with a white flecked dot wool for 30% off. I'm going to make a Winter weight A-line skirt. I only needed one metre which cost me $40. I have the pattern. So I will get a pure wool skirt for under $50. That's not bad huh. 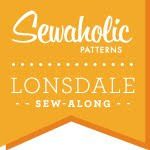 I bought a couple of other more basic fabrics -- one was 30% off and the other 10%. It was REALLY hard to narrow down my choices.